Real Madrid coach Carlo Ancelotti says the 4-0 derby humiliation at Atletico Madrid was the worst performance of his reign at the Spanish giants. Saturday's defeat was leaders Real's heaviest loss in over four years. "It is easy to analyse this game because Atletico were better in every facet of the game," said Ancelotti. "They fought more, had more quality on the ball, had better organisation, everything. It is the worst game we have played since I have been coach." Ancelotti, who was appointed as Real boss in June 2013, welcomed Ballon d'Or winner Cristiano Ronaldo back into his side, but was without a host of other players through injury and suspension. And defending champions Atletico took advantage to stretch their unbeaten run against Real to six matches. "We were a mess and lost all our aerial battles. 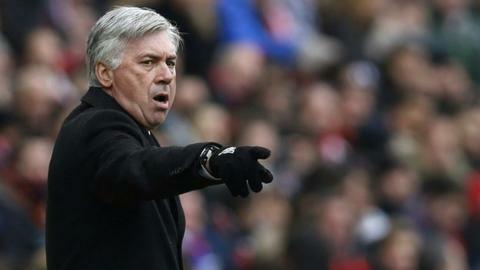 None of our players had a good game," added ex-Chelsea and AC Milan boss Ancelotti. "I have to look at this coldly and accept responsibility for this game. "We have to review what has happened but we mustn't forget that we're still top of La Liga. I have a lot of faith in these players." European champions Real are four points ahead of nearest rivals Barcelona, who visit Athletic Bilbao on Sunday, and third-placed Atletico. "We still need to keep going match by match and see what happens," said Atletico coach Diego Simeone when asked about his team's chances of retaining the title. "A coach can interpret the game in many different ways but it is the players that need to execute the ideas and they were brilliant against Real. I have to thank the players for the way they played. "They were solid and serious and we need to keep going this way."